It’s rare to see residential design with striking, unique architectural value. When I do, I am compelled to celebrate it. The structure at 2919 West Alline Avenue certainly qualifies. It’s newly constructed and mimics modernist Mexican architect Luis Barragán (1902-1988) by incorporating his hallmarks of color and geometry. Many contemporary homes are stuck in a prosaic palette of whites and grays. This one is emotive with splashes of “Mexican pink.” It’s also thoroughly livable. Barragán insisted that the home be a sanctuary—composed of both expansive public and intimate private spaces, ample light, and a thoughtful consideration for uses and activities in each area. Maricela and Mr. Saldana are both natives of Mexico with the intrinsic cultural appreciation for the man, and the project. Distinct among colonials, ranches, and ubiquitous mediterraneans, its exterior is angular and edited. The concrete façade is blunt, but softened with a perpendicular roof panel, more traditional sill details on the left, and half-moon potted trees in front. Inside, a skylight runs the length of first line of sight, highlighted by slats of magenta (that are anything but millennial pink). The space beyond the foyer is open and airy, but grounded in natural browns and yellows. A clean design language and logical flow guides guests toward the dining room, kitchen, and back patio/pool area. There isn’t the stark chill of most modern homes, because uses of white and sharp angles are offset with warmth and textures like pecky cypress paneling in the dining room, mahogany elsewhere in the house, and terra-cotta floor tile. Every part of the house has an unfussy, organic feel. And like nature, its design utilizes repeating shapes and lines—calming for someone who craves natural order. I really love the concept brought to life for David and Maricela’s new home. If I ever have the opportunity to build something from scratch, I too might look to a classic thought leader of spatial design for inspiration, like Luis Barragán. 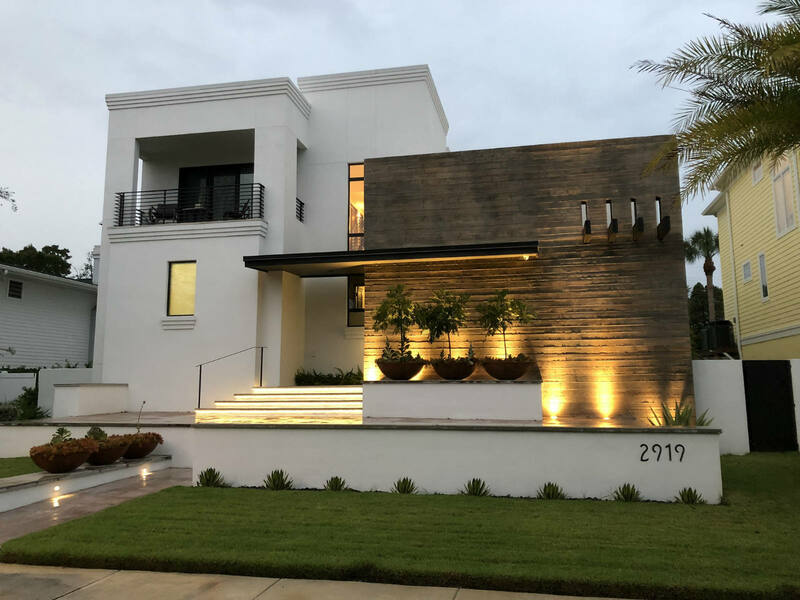 Too few owners who construct expensive new homes take the time to be inventive and work collaboratively with an adventurous architect, perhaps for fear of going too far and risking resale value. Though, we only live once. ¿Cierto? Many thanks to John Saldana of ROJO Architecture for indulging me in a brief interview and for providing professional photos of the property.